The last of summer's bounty color coordinated for fall and ready for freezing, roasting, and munching. I managed to go all summer without posting anything here. Thankfully it wasn't because there wasn't anything going on in the garden; just the opposite in fact. Except for the tomatoes, which didn't like getting 14 inches of rain during two weeks in late July and August (something I didn't even know could happen in Missouri), this was actually one of my best summer gardens in years. And thanks to some timely August seeding, autumn has been great so far too. For the last few weeks we've even been celebrating that rare occurrence around here: lettuce and tomatoes in the garden at the same time. Such a treat. On Friday, though, we had our first patchy frost—which wasn't surprising since our official frost date is October 15th—and yesterday morning everything was white. In anticipation, I picked the last few baby eggplants (how cute are they?) and a bunch of sweet peppers on Thursday. I froze some of the peppers, which is so easy to do. There's no blanching required, just cut the peppers in half, seed and core (save the seeds from the best looking specimens for planting next year if you like), 'spoon' the halves together, and pack them tightly into zipper freezer bags so you don't have a lot of extra air inside. Seal them up, label, and toss into the freezer. Done! The peppers won't freeze into a massive clump, so you can pull out just a few halves at a time if you like. (If for some reason yours do clump together, spread the pepper halves out on a baking sheet and freeze until solid, then pack in freezer bags). Your frozen peppers can be added to practically anything: soups and stews, slow cooked dutch oven dinners, chili, omelets, fritattas. I put some whole peppers in the fridge for salads and dipping raw into my favorite easy low fat buttermilk ranch dressing, and then I roasted the rest: cut into large chunks, toss with olive oil and salt, and roast on a parchment-lined, heavy duty baking sheet at 450 degrees until soft and blackened in spots (if you like them that way), about 25 minutes. Toss the hot peppers with a little balsamic vinegar if desired and salt to taste. These are delicious on their own or incorporated into all sorts of dishes. Most of my pepper plants are still loaded with little fruits—the late planted ones didn't really start taking off and putting out until September—but Saturday night's frost pretty much put an end to them (I'd been covering the beans, cherry tomatoes, and basil plants with fabric plant covers and old bed sheets, but not the peppers), and that's fine. It's time to move on, focus on eating all the autumn greens (and my first ever October green beans!) before they freeze, and maybe even properly tuck the beds in for winter, something I rarely ever do, often because by the time I'm done trying to keep the warm season plants alive in the cold, the ground is too frozen to yank them out. Or I've simply gone in another direction (or six) and forgotten about them. But even just covering your garden beds at the end of the growing season with cardboard (weighted down with rocks if necessary) can mean the difference between a thick and vigorous carpet of weeds and happy, worm-filled soil that's ready for digging come spring. So how did your summer garden grow? Anything going on out there now? © FarmgirlFare.com, where we're falling into autumn with harvest baskets filled with bounty and hearts filled with delight. 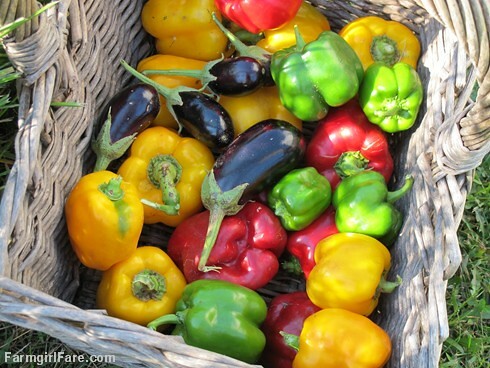 Ah, now don't be mean with sharing your garden's beautiful harvest, OK? Here in my shady London handkerchief of a garden we had, oh let me see, two handfuls of beans, three cucumbers and some salad and herbs this whole entire summer. Raspberries too. Actually sounds quite good when I list it like that. Lovely to see your basket of jewel colours though! So glad to see you in my mailbox. Welcome back. We haven't had frost yet in NJ but I think it's just around the corner. I'll be picking the last few baby eggplants and green tomatoes by the weekend. I'm hoping the cooler weather makes the kale happy. A few plants finally came up at the end of September. What a helpful post! I have had a mountain of peppers this year, and knew I could chop and freeze for cooking, but the roasting is a great new thought I'll try today! Thanks from Tennessee. Welcome back to the internet, I've missed reading your updates :) That's a GORGEOUS harvest you have there, I'm jealous! The only thing I got so far, is one plateful of greens. We got our first frost too. Kind of sad but then again that means planning for next year and new books!!! I had a pretty good harvest here in Missouri myself. I still don't have all of my jalapenos processed they are drying. Just last night we got the peanuts shelled and I will be roasting them probably this week. I've read through so much of your archives! We started our first garden this year. 188 sq ft for my brown thumb to try and manage! Looking forward to all your posts! What a wonderful harvest! We're looking at growing a number of bell peppers and aubergines (eggplant) this year and we were wondering how to preserve some of them. My other half has a dehydrator so he's going to be going crazy with that but I like the freezing option a bit better! March 2013 update: My apologies for the inconvenience - I know word verification is a pain - but I've had to turn it on to help stop the ridiculous number of anonymous spam comments I've been getting every day. Thanks for your understanding. Welcome to InMyKitchenGarden.com! Thanks so much for taking the time to write. While I'm not always able to reply to every comment, I receive and enjoy reading them all. Your feedback is greatly appreciated, and I especially love to hear about what's going on in your own garden. I know, too, that other readers also delight in reading about your garden successes, failures, helpful tips, and lessons learned. Feel free to leave comments on older posts! I try my best to answer all questions, but sometimes it takes me a few days to get to them. And sometimes, I'm sorry to say, they fall through the cracks, and for that I sincerely apologize. I look forward to hearing from you and hope you enjoy your visits to my kitchen garden! How To Grow Your Own Gourmet Lettuce From Seed - It's Easier Than You Think! © 2006-2017 FarmgirlFare.com Please do not copy or take images or content from this site without permission. Contact hellofarmgirlfare AT gmail DOT com Thanks! © Copyright 2006-2011 FarmgirlFare.com. All rights reserved.. Simple theme. Powered by Blogger.